Taldor’s warriors have perfected the art of fighting with the falcata and buckler in an art they call rondelero. They use their bucklers both to defend themselves and to launch unexpected strikes while chopping and hewing at their foes’ unprotected bodies and heads with their falcatas. Rondeleros wear any type of armor, but favor bucklers, and are comfortable using both hands for offense and defense. At 2nd level, a rondelero can perform a shield bash with a buckler (use the same damage and critical modifier as for a light shield). At 3rd level, a rondelero can catch his opponent’s weapon between his buckler and his forearm, effectively wedging the hafts of polearms and hammers or the flats of blades. This functions as a disarm combat maneuver, and the rondelero gains a +4 bonus on the roll. If the rondelero’s attack fails by 10 or more, he suffers a –2 penalty to his AC until the start of his next turn. At 5th level, a rondelero gains a +1 bonus on attack and damage rolls when wielding a falcata and buckler that applies to attacks made by either hand. These bonuses increase by +1 for every four levels beyond 5th. 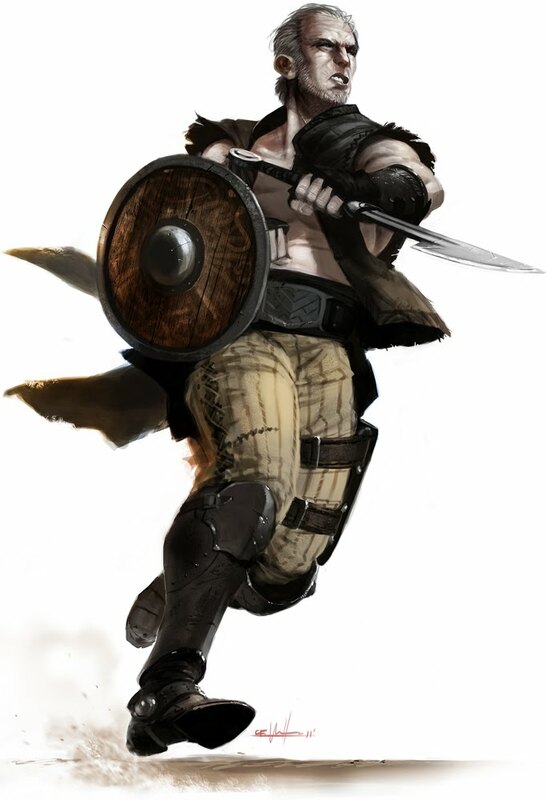 With a full-attack action, a rondelero may alternate between using his falcata or his buckler for each attack. This does not grant additional attacks or incur penalties as two-weapon fighting does. At 7th level, a rondelero gains Armor Training 1, and can move at his normal speed in medium armor. At 15th level, the rondelero gains Armor Training 2, and can move at his normal speed in heavy armor. At 11th level, as a standard action, a rondelero can make a single melee attack with a falcata. If the attack hits, he may make a sunder combat maneuver against the target of his attack as a free action that does not provoke an attack of opportunity. Suggested Feats: Exotic Weapon Proficiency (falcata), Improved Shield Bash, Improved Two-Weapon Fighting, Power Attack, Shield Slam, Shield Master, Taldan Duelist, Two-Weapon Fighting, Weapon Focus (falcata), Weapon Specialization (falcata).